1. Badaling Great Wall: It is the nearest section of wall from Beijing. It is highly over commercialized and crowded. We don’t recommend this section of wall to hikers who want to see the untouched authentic Great Wall of China. 2. Mutianyu Great Wall: Mutianyu Great Wall is a stretch of restored Wall . It is comparatively smoother than most of other sections. It is a less-crowded than Badaling Great Wall. You can also take cable car up and toboggan (slideway) down.. We don’t recommend this section of wall to hikers who want to see the authentic untouched Great Wall of China. 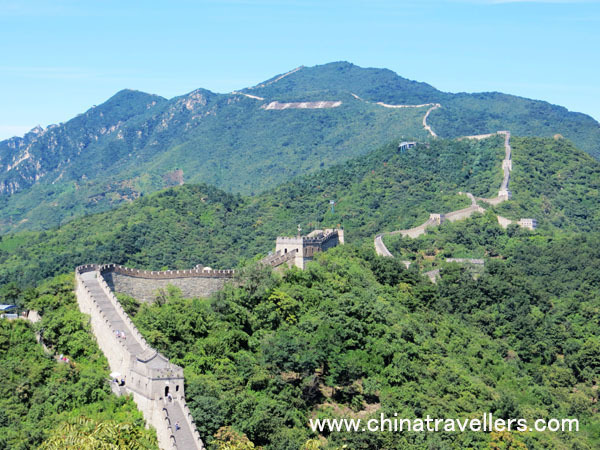 China Travellers offer two hikes which covers both wild untouched Great Wall and Mutianyu Great Wall. You will walk on both restored and unrestored authentic wild Great Wall. The hike offers an excellent chance for you to compare and contrast what the wall may have looked like when they were originally finished, and how it looks after about 600 years of exposure to the elements. 3. Jinshanling Great Wall: Jinshanling Great Wall is about 150 kilometers from downtown Beijing and boasts the greatest number of watch and beacon towers anywhere along the wall. As there are relatively few tourists at Jinshanling Great Wall, it is a good place to explore on foot. If you are looking for breathtaking views with a relatively peaceful walk, then the Jinshanling Great Wall is very suitable for you. You can also explore a few watch towers in the stretch of Simatai Great Wall. 4. Simatai Great Wall: The Simatai Great Wall stretches about five kilometers (three miles) from the Watching-Beijing Tower in the east and connects to the Jinshanling Great Wall in the west. It has 35 beacon towers. The Simatai Great Wall is celebrated for its steepness, queerness and intactness. The main tourist attractions include the Stairway to Heaven, the Fairy Tower, the Heaven Bridge and the Watching-Beijing Tower. It has been rebuilt since 2009 and hasn’t opened to the public yet. Watching-Beijing Tower (Tower for Viewing the Capital) is the topmost tower of Simatai Great Wall. It lies on a very steep mountain. At an elevation of 986 meters, it is regarded as the summit of the Simatai Great Wall. It is said that people can see the lights of Beijing at night and the White Dagoba in Beihai park by day in the distance 120 km away. 5. Gubeikou Great Wall: Centuries ago, Gubeikou was a strategic pass which provided much needed access to Inner Mongolia and northeast China. Wars were common to gain control of this point and continued until the Qing Dynasty (1644-1911). Remnants of past battles can be seen on some of the broken bricks and stones. Until today the Gubeikou Winding Dragon Great Wall retains its fascination as its raw condition is still evident. The tranquility at the ruins of the Great Wall is really touching. The Gubeikou Winding Dragon Great Wall is located in the middle section of Gubeikou, where most of the historical wars took place. In ancient times, both warring parties placed emphasis on securing the Panlongshan Great Wall, because each knew that once the wall was captured, the Gubeikou Great Wall would be readily occupied. The whole wall measures about 13 kilometers (3.1 miles). Of its over 40 watch towers, the General Tower is the most famous. It is located at the commanding elevation of Panlongshan Mountain, from where wars were directed. There are four arrow windows on the north and south sides respectively, while each of the east and west sides has three arrow windows. This section of the wall is of unique construction: it is made up of earth walls, stone walls and brick walls.